When Humphrey Bogart in 'Casablanca' demanded that the pianist at Rick's nightclub,“Play it, Sam; play 'As Time Goes By'” - he never actually said, “Play it again.....” - he was expecting a pretty faithful repetition of his favourite song. And there is a thing called choreology which can faithfully annotate a dance work so that its repetition achieves a remarkable likeness of the original. But, right from the start at Carriageworks in Sydney last Friday, choreographer (and former dancer) Stephen Page warned us not to expect his reprise of 'Ochres' 21 years down the track “to be like the first time”. Why not? Those five performances at the Nambunbdah Festival at Belvoir Street Theatre in September 1994 were the breakthrough that the young Bangarra Dance Theatre, Stephen Page himself, and, arguably, audiences who wanted to experience some sense of Indigenous culture without having to head for Arnhemland all needed. No wonder that the company cancelled its sixth performance to appear at Paul Keating's 'Creative Nation' policy launch in Canberra. And no wonder that Page – introducing 'Ochres' 2015 – referred to that era as “Paul Keating time”! Jill Sykes in the Sydney Morning Herald hailed the original for its “fusion of thematic and movement sources in a way that speaks directly and clearly to an audience without any signs of self-consciousness”. I was there too, and told Sydney Review readers that Page's speech about the spiritual significance of ochres was unneeded, “He'd said it all in his choreography...fusing the traditional and the modern, crossing between life in those two worlds and telling stories that delighted the eye”. For this slip of a lad from South Brisbane, who once admitted to me that a life of crime was only slightly behind the possibility of a life in dance, had been inspired by his Nunukul/Yugambeh father to take time out in Arnhemland with the Yolngu and open his eyes to the non-urban Aboriginal world. 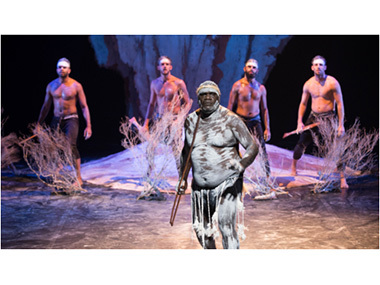 This humility keeps paying back with a series of cultural advisers for Bangarra from that area – especially the amazing Djakapurra Munyarryun appearing in both productions of 'Ochres' 21 years apart. In between, he starred in the Olympics opening ceremony, of course. But Page has moved on – so have the skills of his dancers. So, it's a better danced, more contemporary 'Ochres' seen today at Carriageworks – better danced, apart from the aching absence of Stephen's brother Russell, the best Australian male dancer of his time – sadly cut short. Today there's more team-work, less individuality – apart from Djakapurra, a mountain of a man today compared to his 1994 self, but still as extraordinarily light on his earth-rooted feet. His massive presence – moving, singing, didg-playing or just standing – is undoubtedly the show's highlight, almost matched by the concentration of Elma Kris in everything she contributed. Personally, I think that the show suffers in comparison with the original. But memories of such ephemerality are notoriously dodgy. Maybe the Yolngu connection has weakened – the Yellow sequence for the women – credited to co-choreographer Bernadette Walong - seemed to lack the commonality and intimacy of tribal life that I remember; and the culminating White section had lost what I described in 1994 as its capacity to “slip from the domestic to the mythic – and back again – making dancers invisible in the internalised intensity of their performance, transforming Arnhemland's chalky shield against the evils of the night into ordinary urban make-up as they re-humanised”. However, the energy of the Black chapter, where men reveal innate hunting, challenging and fighting, even animal instincts, was memorable; and the Red section, showing male and female relations ranging from the intimate to the violent, was moving, ending with a traditional medicine woman dealing with a sick man. So the show's strength lay in individual achievements – the corps de ballet work lacked Bangarra's usual originality. Intriguingly, the third Page Brother – David – revealed that he'd done virtually nothing to update his score, which felt as fresh as ever in its melding of the traditional and the contemporary. I swear I picked-up on a Torres Strait Islander rap that I'd not noticed in 1994! And the Ernabella women's chanting in Yellow feminised the stage perfectly. Perhaps the hugest difference over 21 years is the audience! Belvoir was not crowded when 'Ochres' opened, and the Enmore Theatre where it returned after a year on the road in such places as Berlin and Tokyo was bigger but rougher. At Carriageworks, their largest venue was filled on opening night – and hopefully on succeeding nights until 5 December. For this is a work to treasure for its ideas and its history.